Welcome to the Libra House Montessori School. 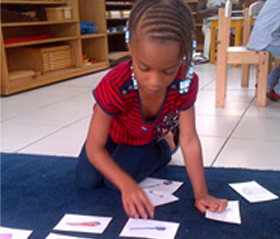 Established in 2004, the LHMS is a haven for learning and discovery; staffed by qualified Montessori practitioners and with a wide range of authentic, premium Montessori materials the LHMS provides a true Montessori foundation. Situated in a leafy, serene area of Ikoyi, we offer children aged between 18 months – 6 years, a happy, ordered environment in which children are able to explore and discover; to learn about the world around them in a manner that best supports their own efforts. Encouragement and appropriate challenge is provided, always in view of the child’s own pace; affording them the unique opportunity to think and do for themselves towards the ultimate realization of each child’s full intellectual, social and physical potential. To provide an Environment which supports the education of the ‘whole child’. This supportive space allows opportunities to explore, engage and discover, ensuring children meet all developmental goals whilst acquiring the independence and confidence to thrive in pre-school years and beyond, enthused with a love of learning. For all children to discover their full learning potential whilst nurturing care and respect for self, others and the world around them.